Any pet owner will tell you that there are few things more important than their little furry (or scaly, or feathered, or hooved) friend. There are many pet owners who will admit to having more pictures of their animals than their own family (not that that’s a bad thing!). Those photos become even more important after we’ve had to say goodbye. 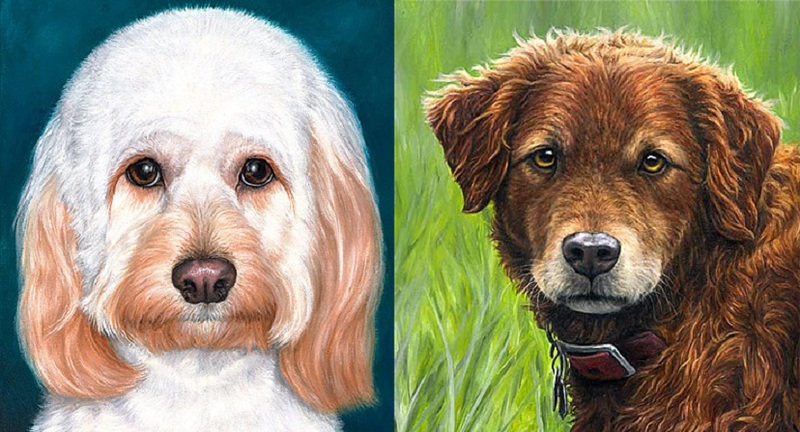 Leah Knecht has been painting since she was a child, and she has turned her love for animals into a career of portrait painting of both animals and people. But it was the loss of her own beloved pets that led her to it. Knecht loved to paint as a child. She eventually attended Pasadenaâ€™s Art Center College of Design, majoring in illustration, later becoming a full time teacher of the art of oil painting. â€œIllustration involves bringing out the best in an image through understanding of anatomy, form, tones, lighting, and detail,â€ she explains. Through the combination of growing up with animals, and her own training and teaching in the art of illustration, Knecht portrays animals in a way that truly brings them to life. Knecht can also work from old photographs to vividly bring the pet back to life. She of course, credits her training, as well as her clear understanding of anatomy, to recreate the petâ€™s own individual look. Knecht’s ability to work from photographs and closely with her customers allows her to create accurate and meaningful portraits for those who have had to part with their best friends. Another commented, “You captured Coleâ€™s personality, not just his looks.” Of course, any pet owner can tell you, every animal has their own special personality which transforms them into more than just an animal- they’re a companion. And thanks to the power of the internet, pet lovers from all around the world can submit photos of their faithful companions to Knecht using the really simple and very detailed instructions provided on her website. So go ahead and snap away without shame. Leah Knecht and Classic Pet Portraits can be reached at (626) 644-8081, and leah@classicpetportraits.com. For more information on how to commission a portrait, please visit www.classicpetportraits.com.